The five accused Muslim terrorists arrested in rural New Mexico near the Colorado state line this summer after an alleged school-shooter terrorist training facility was raided Aug. 3 were indicted last week on weapons and conspiracy charges by a federal grand jury. 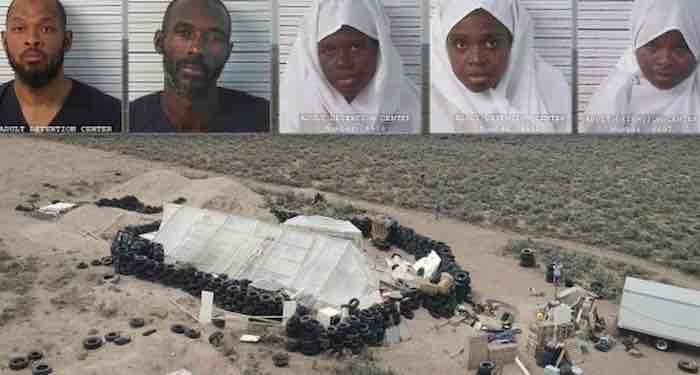 This is the case in which five adults, including Siraj Ibn Wahhaj, were arrested after authorities found 11 hungry, filthy children living in squalid conditions in a terrorist training compound in Amalia, Taos County, a remote part of New Mexico. The children were reportedly being trained to commit school shootings. The remains of a three-year-old disabled boy, since identified as Wahhaj’s son, Abdul-Ghani Wahhaj, were discovered on the property which was filled with weapons. The five individuals faced state-level child abuse charges but those were thrown out after local prosecutors failed to conduct preliminary hearings within state-imposed deadlines. The local district attorney said the charges will soon be refiled. To the horror of law-and-order and counter-terrorism advocates, Judge Sarah C. Backus (D) of the Eighth Judicial District of New Mexico ordered the jihadist quintet released in August. Backus claimed a voter-approved state law left her no choice but to order the release of the defendants on a mere $20,000 bail per defendant with no up-front deposit. Feigning ignorance of the nature of Islamic terrorism, Backus wrote in her decision at the time that even though “[t]he state alleges that there was a big plan afoot … the state hasn’t shown to my satisfaction and by clear and convincing evidence what that plan was.” She added cutely that none of the defendants had a criminal record. The FBI arrested the defendants on Aug. 31. The day after the indictment was approved by a federal grand jury on Sept. 11, federal Judge Kirtan Khalsa denied bail for all the defendants. What’s particularly interesting about the indictment is that Siraj Ibn Wahhaj, whose father of the same name is a notorious jihadist imam, is not identified as the terrorist cell’s religious leader. Wahhaj’s father, who was close to the Blind Sheikh who orchestrated the bombing of the World Trade Center in 1993 that left seven people (including an unborn baby) dead, is deeply involved in Democrat politics. Imam Wahhaj used to be a member of the Council on American-Islamic Relations’ (CAIR) national advisory board. He offered an opening prayer at an event called “Jumah at the DNC” at the Democratic National Convention in 2012 and has been called the spiritual adviser of jihad sympathizer and Bernie Sanders supporter Linda Sarsour. Sarsour co-chairs the Women’s March organization and openly admits membership in America’s largest Marxist group, the Democratic Socialists of America (DSA). Leveille reportedly used to work at Imam Wahhaj’s terrorist-linked mosque, Masjid At-Taqwa, in Brooklyn, N.Y. All five co-conspirators are related by blood or marriage. The defendants stand accused of gathering firearms and ammunition and shipping them from Georgia to New Mexico, as well as transporting minor children across state lines. The Taos News reports that at the Sept. 12 hearing before Judge Khalsa testimony from FBI Special Agent Travis Taylor was presented. Taylor said two of Leveille’s six children living at the compound, in this case, a 15-year-old and a 13-year-old, told him Leveille described herself a kind of prophet and claimed she was receiving divine messages from the “Angel Gabriel.” It is a tenet of Islam that Gabriel, an archangel, dictated the Koran to Muhammad. Taylor said Leveille also told the teens the toddler would be resurrected as “Jesus Christ” and would then instruct the group as to which corrupt government institutions they were to either convert to their beliefs or destroy.